The absence of a national figure to take Modi has compelled the Opposition to avoid talking of an acceptable leader. Rahul Gandhi, who is seen to be less equipped in tackling various issues it is not surprising that the BJP has sought to construct the narrative as ‘Modi versus the rest’. Congress is pleased that Rahul Gandhi’s personal popularity rating in southern India is higher than that of Narendra Modi. But it will bring little electoral gains for the party in the region. Barring Kerala and Karnataka, the Congress is a bit player in the south. In Kerala, it is in a direct contest with the Left Front, with the BJP breathing down its neck. And in Karnataka, the party has standing because it is in an alliance with the Janata Dal (Secular). However, in Tamil Nadu, it barely surveys because of its alliance with the DMK, and in Telangana and Andhra Pradesh, the Congress is nowhere in the contest in the face of dominance from regional players such as the TRS, the TDP, and the YSRCP. The Congress, as well as the rest of the opposition parties are desperately trying to skirt the game plan by claiming that in a parliamentary setup, a leader is elected post-poll results. Thus, while there are more people in the south wanting the Congress president as the Prime Minister, they are unlikely to vote for Congress candidates in adequate numbers to help the party form the government at the center. It is inconceivable that the region’s powerful local parties would endorse Rahul Gandhi’s name for prime ministership in case they have the leverage post-poll results. If either of them has a voice, that would be for their respective leaders. Incidentally, barring MK Stalin of the DMK, none of the other regional satraps has pitched for the Congress president’s name for prime ministership. The JD (S) may have given some positive signals, but its alliance with the Congress in Karnataka is uneasy and there are little chances that in the eventuality of a hung verdict, it would back Rahul Gandhi. Most probably, the Deve Gowda-led party would prefer to push forward the candidature of a regional leader. Kerala, where Congress has the best chance in the south, offers an interesting case. Rahul Gandhi is contesting from one of its seats, Wayanad, and that is likely to boost the party’s chances. But the Congress chief has refused to say anything against its chief rival, the Left Front, there. It does appear that the Congress is not bothered so much about winning than about containing the BJP, whose vote share has seen a rise in the past five years. In short, Rahul Gandhi’s high approval ratings remain limited to an issue of academic discourse with a little practical outcome. The case of Narendra Modi is starkly different. The Prime Minister is way ahead of the Congress president in approval rating in the northern belt — Uttar Pradesh, Bihar, Rajasthan, Madhya Pradesh, and Chhattisgarh. The BJP is a major player in all of these states and is in a direct contest with the Congress in the last three of the states. It is, therefore, obvious that the Prime Minister’s high ratings would positively impact his party in electoral terms. This is evident by the fact that, although the BJP recently lost the state polls to the Congress in the last three states mentioned above, it is far ahead of the Congress in various opinion surveys that have come over the past months in the run-up to elections. It helps the BJP’s cause that the states where the Prime Minister’s personal approval ratings are remarkably high are also the ones that contribute the largest number of seats to the Lok Sabha. In Uttar Pradesh, for instance, which gives 80 seats, Modi’s personal appeal is seen as the most effective counter to the SP-BSP alliance. Incidentally, Rahul Gandhi’s ratings are lower than Modi’s in even those states where the BJP has performed poorly in the past. Take the examples of Odisha and West Bengal where the BJP has seen a surge in popularity over the past months, largely due to the Prime Minister’s personal image. Rahul Gandhi, whose party has consistently slipped in matters of acceptance in these two states, has been able to do little to shore up the Congress’s fortunes. Given the fact of Modi’s high popularity as compared to Rahul Gandhi, who is seen to be less equipped than the former in tackling various issues — from foreign policy to economy to national security — it is not surprising that the BJP has sought to construct the narrative as ‘Modi versus the rest’. The Congress, as well as the rest of the opposition parties, realize the dangers of this tactic and are thus desperately trying to skirt the game plan by claiming that in a parliamentary setup, a leader is elected post-poll results. There are two broad reasons for the Opposition’s reluctance to convert the election battle in a part-presidential style. 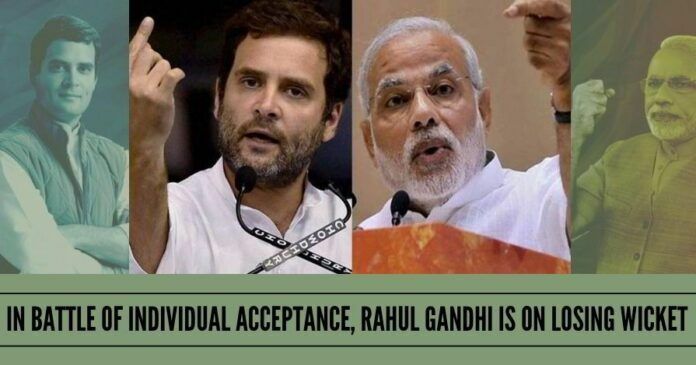 The first is that the chief national opposition party’s leader Rahul Gandhi has no broad across the board acceptance. The second is that the regional outfits who hope to come together after the elections to deny Modi a second term, themselves do not have a consensus candidate. The absence of a national figure to take Modi has compelled the Opposition to avoid talking of an acceptable leader. Next articleMarginalised Hindus not safe in a ‘Muslim’ majority state of Jammu and Kashmir? Indian layman’s perception- crook vs a legitimate, credible, ethical, charismatic visionary who happens to run for the highest political office for the 2nd term. the crook is from the congress party- whose DNA is screw the Indian to make self financial secure through any means and political powerful to enable generational entitlement of welfare scheme for that one family. It seems to me that a significant number of the voting public are willing to stay with the congress party for many reasons- self,corrupt,benefit – this mindset is generational – imagine it is gigantic ship like the Titanic- it will take generations to steer the ship- political & government at all levels- ecosystem- and the public at large along with the voting public- a movement- multi generational- to clean up the layered systems you see, read , hear in all of your daily lives. You have become numb – you cannot feel, see, the hand that has gone into your wallet, purse, pocket- the crackling sound of rupee notes- hard earned- slithering its way to a leech- literally sucking your blood from you, family,loved ones, robbing you of your dreams and vision. and that is what bad actors in politics and government- do to you daily- YOU- the MOVEMENT- have to make your political ecosystem change- and it can only change when you elect public servants who serve you. And the only way to do this is elect people who raise their campaign funding from you- living right there in the neighborhood she/he wish to represent in any body-state,local, center political systems. the idea is simple- at the beginning- 70 yrs ago- along the way political power,greed,wealth,generational power & wealth became embedded- and meandered into every level of politics and government. and here is where you are.take it back- there are clear line drawn- good vs evil- and you know who is in where- and do what it takes.